There was a gap of a month after the South African Grand Prix and in that period James Hunt surprised everyone with victory in the International Trophy in the new Hesketh. There were other new cars in Spain with Tyrrell producing the first 007 chassis for Jody Scheckter and the first appearance of Chris Amon's AF101, which had been designed by Gordon Fowell. There was also the Ron Tauranac-designed Trojan, entered by Peter Agg's Trojan Engineering of Croydon and driven by Tim Schenken. Shadow decided to hire Brian Redman to replace the late Peter Revson, while at Brabham Richard Robarts's short career ended when Rikki Von Opel arrived with a bigger budget. As a result Mo Nunn's Ensign team was missing. In qualifying pole position went to Ronnie Peterson in the Lotus 76 with Niki Lauda's Ferrari alongside on the front row. The second row featured Emerson Fittipaldi in the McLaren and Clay Regazzoni's second Ferrari while Carlos Reutemann was on the third row with Jacky Ickx's Lotus. The top 10 was completed by Denny Hulme (McLaren), Arturo Merzario (showing well again in the Iso-Marlboro), James Hunt (Hesketh) and Scheckter in the Tyrrell. The qualifying was marked by a heavy accident for Vittorio Brambilla in the second factory March although the Italian avoided injury. It was raining on race day and at the start Peterson took the lead while the rest of the field was lost in a cloud of spray. Lauda and Regazzoni were second and third with Ickx fourth and Fittipaldi fifth. The order remained largely unchanged in the early laps although Fittipaldi's car was misfiring and as the track dried he began to drop back, falling behind Scheckter on lap 11. Soon afterwards the cars began to pit for slick tires. During this period Peterson suffered an engine failure and Ickx's Lotus dropped away when he set off with a wheel which had not been properly fastened. Lauda and Regazzoni thus took first and second places with Stuck running third. Merzario was fourth but on lap 38 he went off, his car going over the barriers and landing amongst a group of photographers. Fortunately no-one was hurt. The race was stopped at two hours (six laps short of the intended race distance) and Ferrari ended the day with a 1-2, with Lauda scoring his first GP victory. 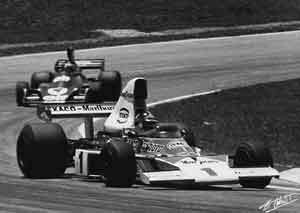 Fittipaldi was able to catch and pass Stuck to claim third in the closing laps. Fifth went to Scheckter while Hulme was able to catch and pass Hunt and Redman to grab sixth.